CCQ celebrated the joyous event and beautiful weather with an Easter Egg Hunt on the Elm Street lawn for all youngsters. It seems that a good time was had by all. Thank you to our admin, Dee and her helpers, for carefully filling each egg. 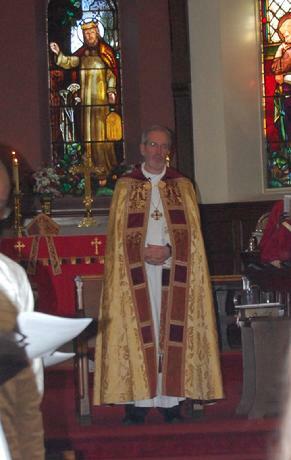 On Sunday March 5th, CCQ welcomed The Right Reverend Bishop Alan Gates. In addition to celebrating our 10 Am services with us, he confirmed seven of our teens and formally received two adults into the fold of the Episcopal Church. After the service, he spent time with the parish as a hour for "social hour" and met with the vestry for a luncheon afterwards. Congratulations to all who shared in making this a terrific day! 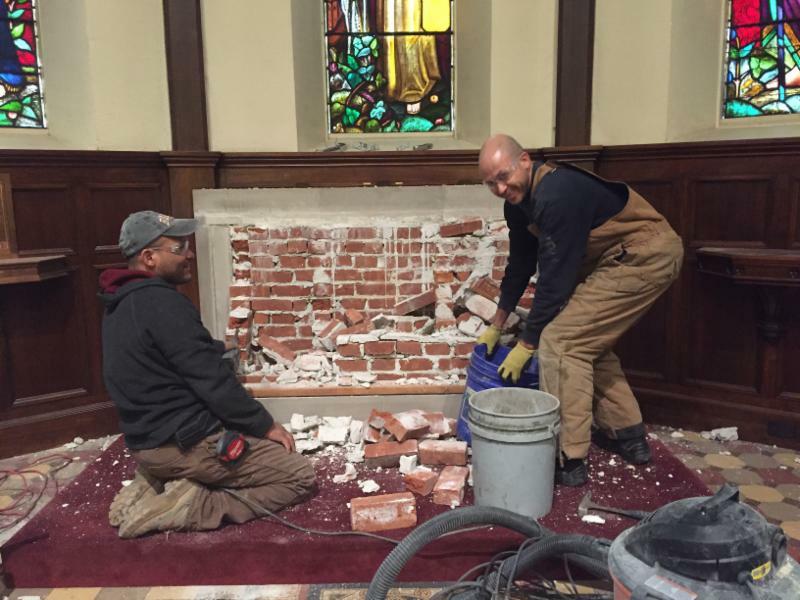 On Wednesday, 18 January 2017, the long awaited refurbishment and renewal of the interior of the historic Christ's Church Quincy main church began. 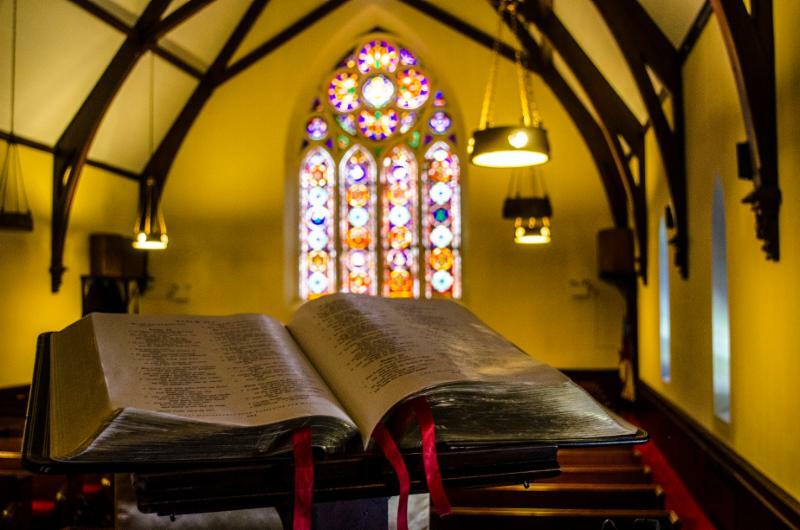 For decades, the parishioners and clergy of CCQ have prayed, discussed, made points and counter points about how best to adapt the area around the table, in church-speak the sanctuary, the broad area where the organ console and choir are, in church-speak the chancel, and the main area of the church where the pews and grand piano are, in the church-speak the nave. 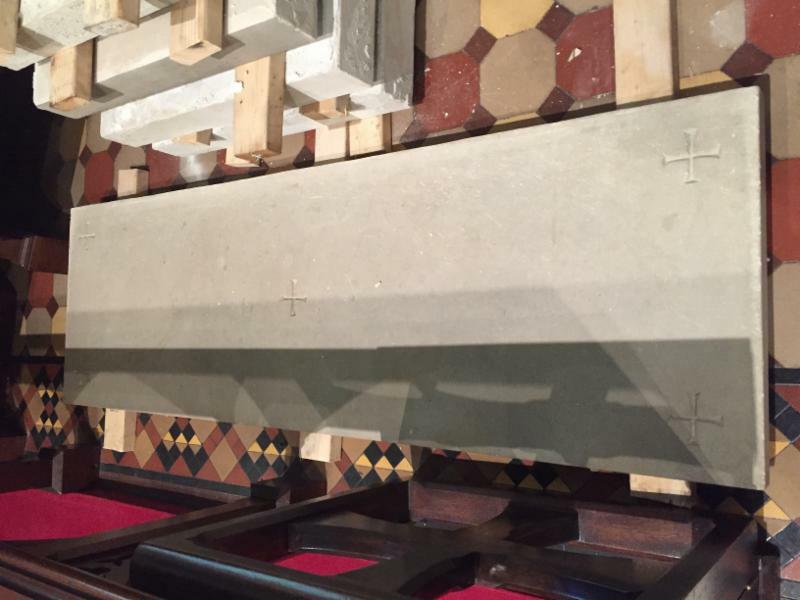 Plans were formulated with some work done, such as the opening up of the chancel by the removal of the second set of choir stalls and moving the organ console out from the little space off to the side. In the nave the baptismal font was restored to its original location providing a clear view of a baptism by the People witnessing and supporting those baptized. And, in the nave several pews were removed to provide much needed liturgical space at the chancel steps and in the West End. 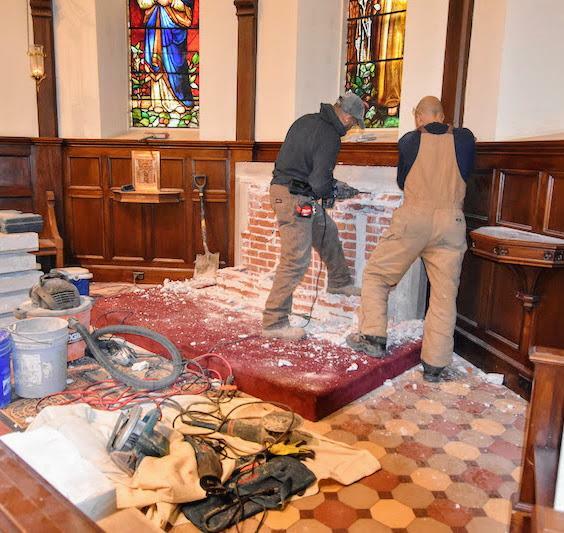 Yet, the plans for major extensive renovation and adaptation to make the entire space fully accessible to all People in the end were beyond the financial reach of the parish. Our thanks and appreciation go to the many people who helped formulate the overall plan, and we all benefit from the changes that were planned and carried out so well. 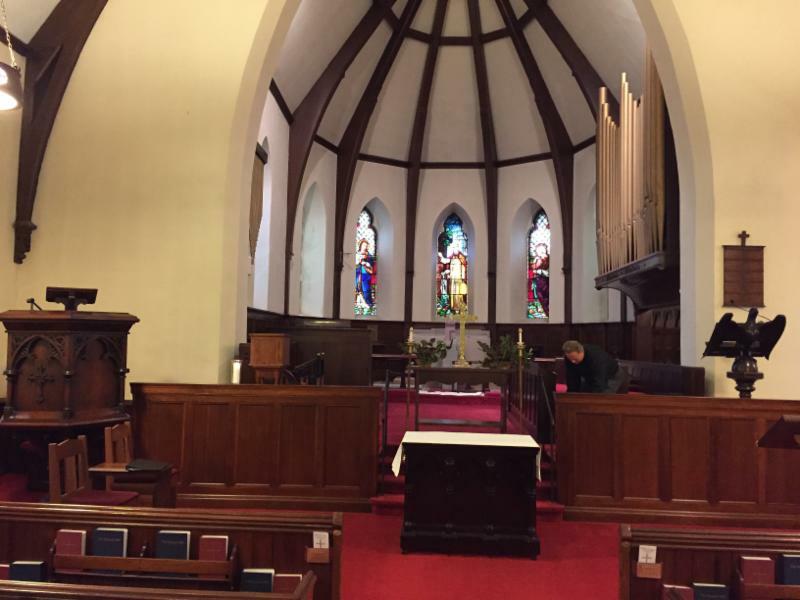 The funding for the changes that took place came, with Vestry approval, from several of the endowed funds of the parish. Last year two things took place. First, last fall the parish received a substantial bequest left to the parish by Trust of the late Dorothy Stevenson. The rector in consultation with her niece and trustee presented the long planned, but never done, process to move the main stone altar from its affixed position on the East End wall and bring it forward to stand at the front of the broad foot- pace it stands upon. This bringing forward allows the main altar to be used by the Presider facing the People rather than facing the East. 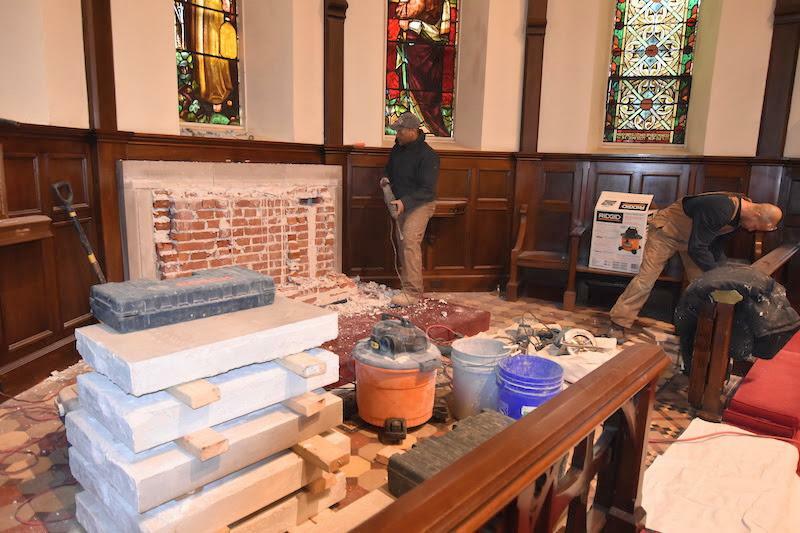 This movement forward fulfills a project that has been talked about, with points and counter points being made in favor of the move and some who preferred that the main stone altar remain affixed to the East wall, since the early 1970's. The last two rectors and the current rector, along with countless guest Presiders, including our Bishops and guest Bishops, have in the meantime presided from a table that made due, but was technically not a table set apart for use as an altar, as the main stone altar is, and really very small to accommodate the elements for consecration, the missal, the candlesticks and any other items needed for the administration of Holy Communion. 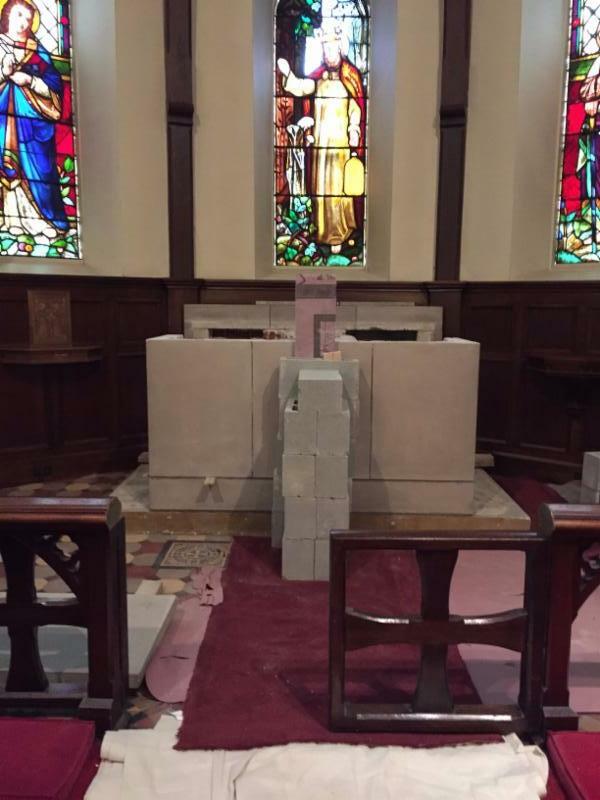 Kathleen Breiten, niece and trustee, "agreed that Aunt Dot would be very happy to have the church use this gift to move the stone altar forward"...and to restore the surrounding walls of the sanctuary. This is offering to the Glory of God is in loving memory of James and Prothesia Smith and Family. 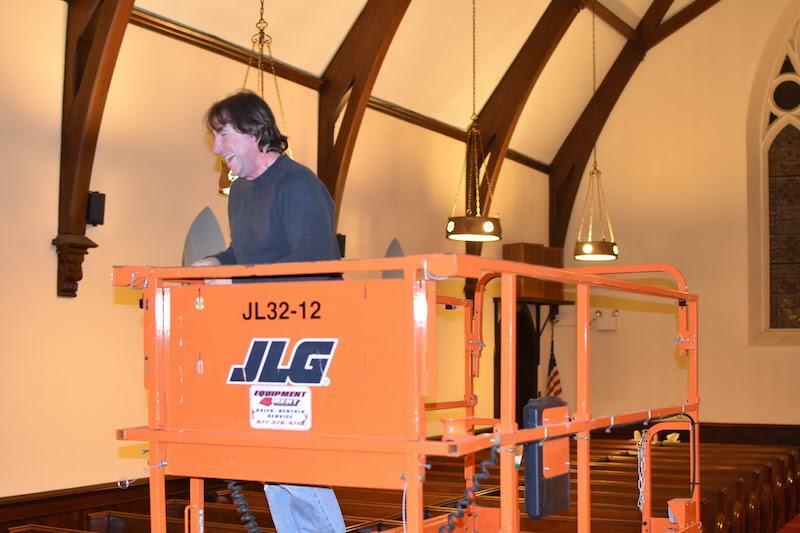 The second action took place this past December, as the consensus of the Vestry was to use the designated endowed funds for the care and beautification of the church building and grounds to continue the work to be done in the sanctuary into the nave of the church. The many years of memorial offerings, and a new organ fund would finally be put to use as intended. 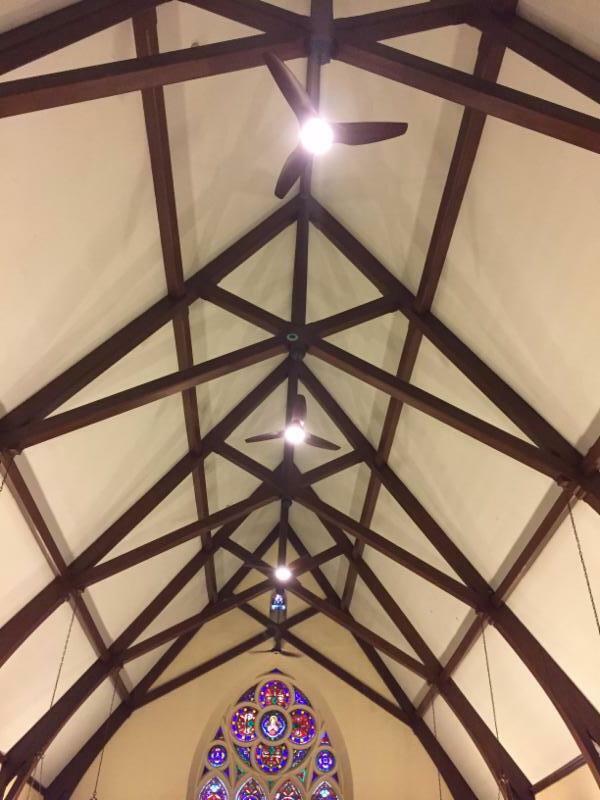 On Tuesday evening the first work took place - the installation of new energy- saving, efficient, functional sleek, silent fans to bring the comforting power of air movement to our worship space. The power lift at the foot of the chancel steps to reach the first of the four fans. 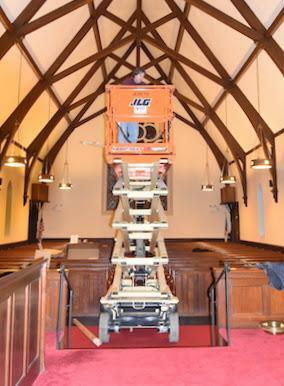 Later that evening the parish electrician, Gary, assisted by Fred Dosenberg, Steve Marcus and the rector installed the 4 new fans some 30 feet above the floor. Gary at work while Fred and Cliff watch. On Wednesday morning the masons from O.J. 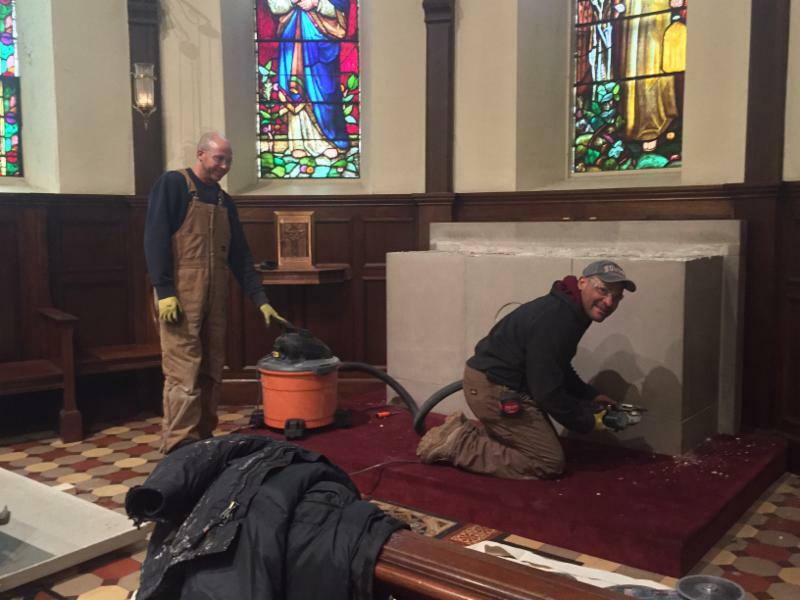 Misdea, quality stonemasons specializing in historic stone restoration services, and the masonry contractors who have worked on the exterior and interior of the church buildings, arrived to begin the work on moving the main stone altar. Removing the ashlar, the slabs of freestone facing outward, only to discover multiple piles of NE Brick pilings supporting the ashlar. After removing the front ashlar, Derocil and Derly carefully chip away at the brick front facade piling. The mensa, the actual table portion of the altar, at rest upon cushioned supportive beams. The ashlar supports that covered the brick columns. Note that church tradition state that only stone materials may provide the support for the table and that the entire altar, including the underlying supports, are one piece. 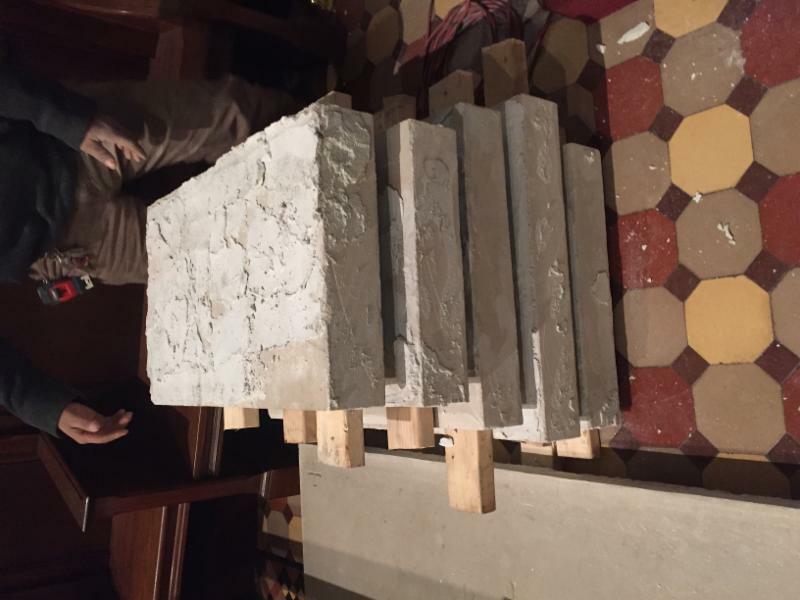 The one solid piece of the main altar removed leaving behind the retable supported by two columns and brick, which will stay, and the opening ready to receive additional bricks to smooth off and later covered with wood paneling to match the wood paneling already in place. The masons from O.J. Misdea have completed their work in removing the main limestone altar from its affixed position on the East End wall and brought it forward to rest at the front of the broad footpace it stands upon. In going through some of the historical records we found that then Rector, the Rev. Howard Key Bartow, 1921-1937, connected with the Boston based interior decorating firm: Pennell, Gibbs & Quiring Company. This particular firm was well-known to the rector and the copy of the letter to the firm, he writes: "I am very anxious to have you do the work and not go to Cram or Collins and Allen. I have perfect confidence in your ability and taste." He later writes: "We have, of course, in the parish those who believe that the work of decorating the church could be done by any painter, which of course is a fallacy." The firm, at that particular time, was considered the premier decorating establishment in Boston and throughout the US. The plans they offered for the re-design of the interior of the church as part of the overall redesign initiated by the rector that removed a substantial amount of the Victorian brass work, brought in the new (current) simple limestone altar, and all new chancel furniture complimented these changes. One area that the rector, and subsequent people over the years, and the designers were confounded by; what to do with the church floor, which according to the rector, "has been a nuisance for a long time." In the end, the wood floor was simply "cleaned thoroughly and shellacked" with an appropriate wool runner laid down. Another item we discovered was the very top panels of the vaulted ceiling apse were done in matted and toned down gold leaf while the next level down of the vaulted ceiling was painted in blue glaze. The surrounding walls in the apse and chancel were textured and finished with "mottled shades of glaze colors". The colors were not listed, however, the records recorded the walls in the sanctuary were umber (a reddish brown color) using the mottled technique of decorative painting. This new color scheme eliminated all of the original colors of the walls, painted in grand Victorian style of: celestial blue, terra cotta, yellow and umber -which at first seemed an unlikely and even an unappealing combination, are now beginning to make a great deal of sense when you look at the black and white photographs of the earliest interior views. This view shows the actual sides of the altar reassembled at the very front of the footpace. The portion of the limestone still against the East End wall will remain there. It is the retable upon the cross and candlesticks sit, as before. The interior portion has cement blocks bracing the sides. Notice that the space between the wall and the altar is large - larger than the open space available when the free-standing table was placed in the area just out front of the footpace. And, another advantage is the beautiful and historic tile floor, made by the same tile maker who created the tiled floor in the Adams Mansion library, is now in full view. The rear wall is to be finished off in paneling similar in style and in color to the current wainscoting paneling in place. 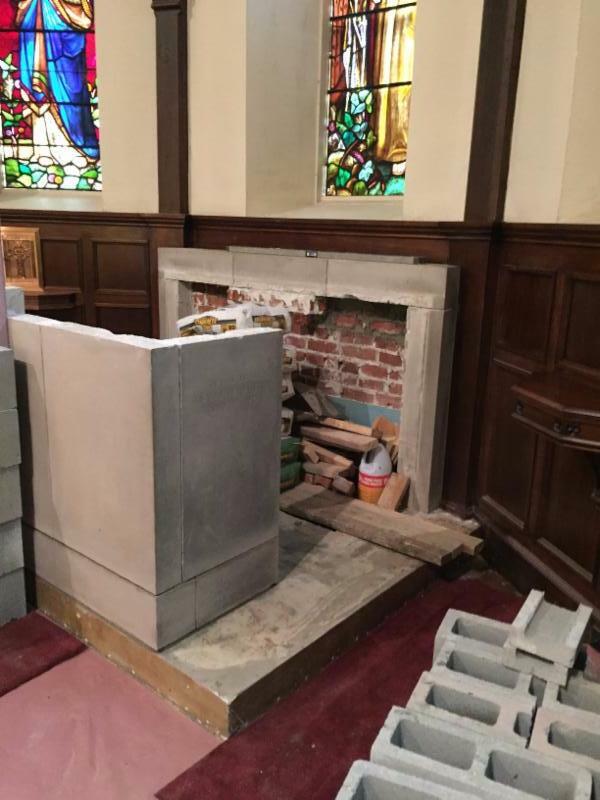 Cinder blocks braced the front of the altar while the newly grouted joints dried. This is the view from this past Sunday. The actual "table" still rest cushioned on the floor. 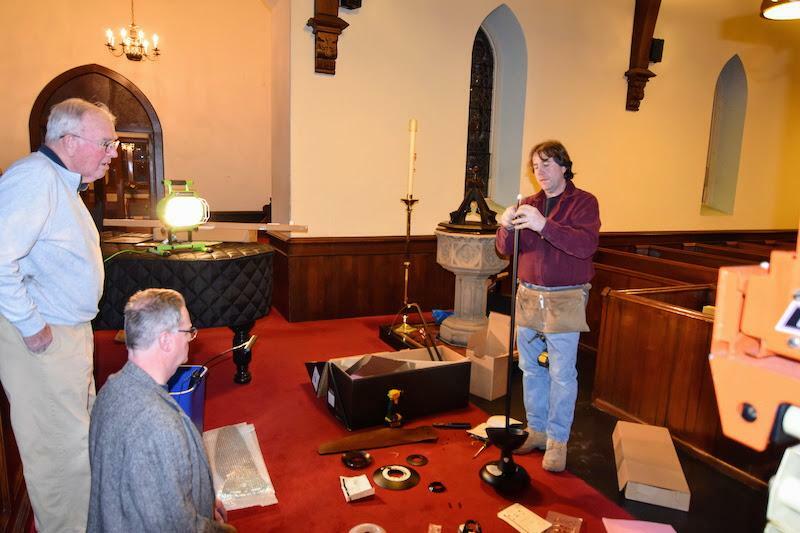 The portable "Eight O'clock" table remained in place this past Sunday for the ten o'clock service. The table behind held the cross and plants, while the torches provided the light. The rector and seminarian sat to the far side by the pulpit. 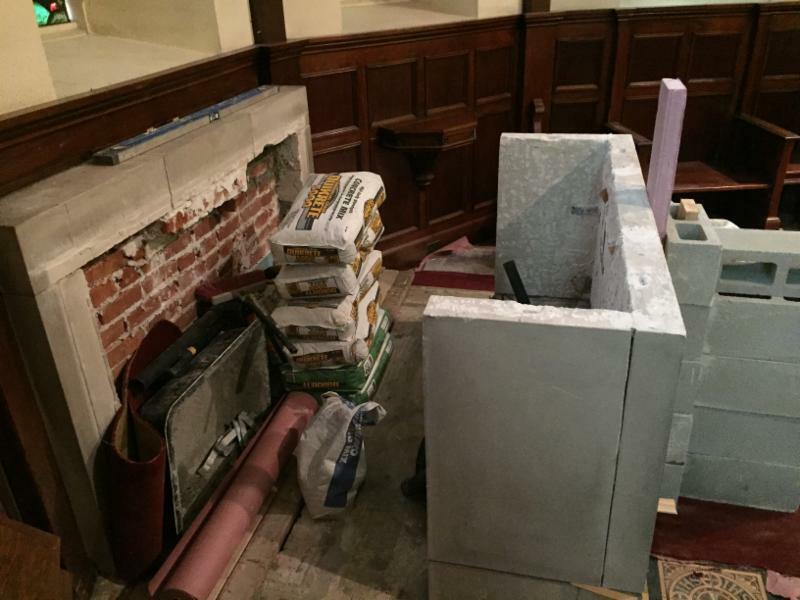 The chapel aumbry was brought up to hold the reserve sacrament far away from all of the work in the sanctuary.